The Hawkeyes had a few opportunities to close the game out against Purdue last weekend in West Lafayette. 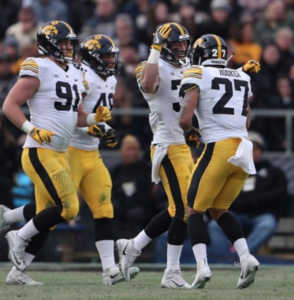 In a game where Iowa had a few spots of momentum it was, the defense that couldn’t hold it together for four straight quarters. Purdue scored 38 points and accumulated almost 450 yards of total offense. That was the most points Iowa had given up all season and the most yards it had given up since the Wisconsin game. 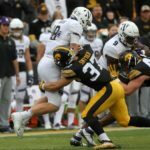 This weekend, the Northwestern Wildcats will make the four hour trek west and come into Iowa City being the leaders of the Big Ten West. Sitting at 5-4 overall and 5-1 in conference play, the Wildcats have the inside track of representing the division in the Big Ten Championship in a few weeks time. 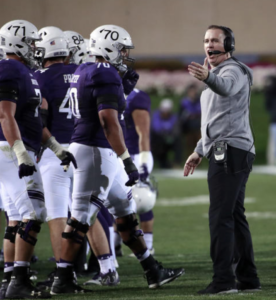 When asked about the outlook of the division the rest of the way, as well as the Iowa and Purdue going on just before its games against Notre game kicked off, Northwestern Head Coach Pat Fitzgerald offered little insight into that. Northwestern offensive lineman Tommy Doles said after the Notre Dame game that the end goal is still insight and a key to getting closer to their goal starts this weekend against Iowa. A big one, indeed Mr. Doles. It is of note that Iowa is still ranked eight in the country in total defense. Even before last week when Iowa’s defense was still in the top five, top ten is nothing to snuff about. Iowa gives up around 284 yards per game. The only other Big Ten defense ranked in the top-20 is Michigan. Michigan gives up a measly 216 yards per game. On the ground, Iowa is the fifth-ranked rushing defense in the country allowing just over 86 yards a game to its opponents. At times this season, the Wildcats have entirely abandoned the run. There was a three game stretch in September and into October where Northwestern did not mount more than 32 yards of rushing offense in any of its games. The past few weeks, on the other hand, the ‘Cats have tallied 418 yards of rushing offense and a total of seven rushing touchdowns. The passing defense for Iowa ranks in the top 40 nationally. Not as fantastic as its rushing defense, but still better than over two-thirds of the other programs in the FBS. Northwestern has had games where it passes for over 400 yards and games when it passes for under 150. 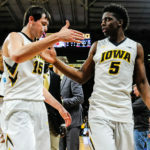 Offensively for the Hawkeyes, they will be back at home. The Kinnick crowd is sure to give them an extra boost when at times the past few weeks they haven’t been able to find one. The defense will also be back on its own turf and ready to get to Northwestern quarterback Clayton Thorson. Iowa and Northwestern will kick off shortly after 2:30 p.m. You can listen to coverage of the game at KRUI’s Mixlr page.